We believe that every business great or small should be able to share their message through professional audio. Quality is valuable, but so is your company's time and it's resources. That's why we ensure that your company's professionalism, high standards, and values are projected through every moment of your podcast. It's not just sound, it's your voice. Unlike video, Audio provides your listeners with the freedom to take your message with them wherever they go. From driving to work in the morning, to the gym, or listening to your content over dinner, audio is the preferred media format for busy Americans. Clear Commo is Powered by RØDE Microphones! RØDE is an industry leader in audio recording equipment. We exclusively use RØDE microphones for all of our recording, so you can rest assured that your company’s content is being recorded through the very best microphones. 50% of all US homes are podcast fans. That’s over 60 million homes! 69% of those polled agreed that podcast ads made them aware of new products or services. 42 million Americans listen to podcasts weekly, five times more than go to the movies. Audiobooks are the fastest growing segment in the digital publishing industry. Michelle Cobb of the Audiobook Publishers Association stated, “26% of the US population has listened to an audiobook in the last 12 months. Hit #9 on Apple Podcast Charts! Host Chelsey Weber-Smith explores the sometimes hilarious, sometimes distressing stories of modern and historical American freak-outs, why we fear the wrong things, and what these bizarre panics might be covering up. Produced and Edited by Clear Commo Studios. 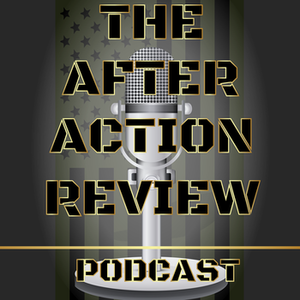 The After Action Review (AAR) is all about Veteran entrepreneurs! They share their experiences and lessons learned from the military and how they're bringing all of that to their entrepreneurial endeavors. These are their stories, from military service to entrepreneurship. Produced and Edited by Clear Commo Studios. Clear Commo and Green Beret Media covered this live event in Washington D.C. sponsored by Capital Post and Bunker Labs. Unlike many other “turn key audio solutions”, Clear Commo takes the time necessary to get to know you and the audio you want to create. We don’t churn out noise, we help you create an audio product you’ll be proud to put yours or your company’s name on. Every show, book, and project is as exciting to us as it is to you! Dedan "Rod" Rodriguez is the chief Podcast Producer and founder of Clear Commo Studios. He’s also the host of The After Action Review Podcast, a show dedicated to promoting Veteran entrepreneurship. His passion is audio and helping businesses find their voice in the world of podcasts. Rod continues to serve as a US Army Reserve Warrant Officer.